Day of the Dead in Lithuania (Vėlinės): Where Pagan and Christian Traditions Meet in Enchanting Cemetery Settings. Vilnius in Love, a tour company specializing in unique and personalized excursions across Lithuania, invites to special tours of unique cemeteries, autumn countryside, and the Hill of Crosses. October 23, 2017 – Vilnius, Lithuania. On the first day of November, Lithuanian offices, shops and schools close, roads become packed with cars, families reunite, and everyone heads to one special place – the cemetery. According to the old Lithuanian tradition, this is the time to remember the ancestors and to re-think one’s place in the world. When Lithuania finally accepted Christianity (last country to be “baptised” in Europe), pagan and Christian traditions blended into one over time, giving special significance and depth to the Lithuanian Day of the Dead. Did you know that the Old Vilnius Cemeteries belong to the list of European historical cemetery heritage? There are three main cemeteries in Vilnius city center: the first one, Rasų Cemetery, was founded in 1796, and is the eternal home to famous Lithuanian poets, artists and politicians, such as the activist and folklorist Jonas Basanavicius and composer and painter M.K. Ciurlionis. This was the first cemetery that was founded outside of the city, on a hill surrounded by old oak trees. The name of the place – Rasos – suggests this used to be an ancient pagan ceremony site. Antakalnis Cemetery is commonly o referred to as the Military Cemetery. 12 of the 14 Soviet Union protest victims from 1991 TV tower attack are buried here, as well as the victims of Soviet Medininkai Massacre. Among other perished soldiers there are graves of Polish soldiers from 1919-20, Lithuanian, German and Russian soldiers who have fallen in World War 1 and thousands of French soldiers of Napoleon’s Army, whose remains were found in Vilnius and reburied in Antakalnis in 2001. 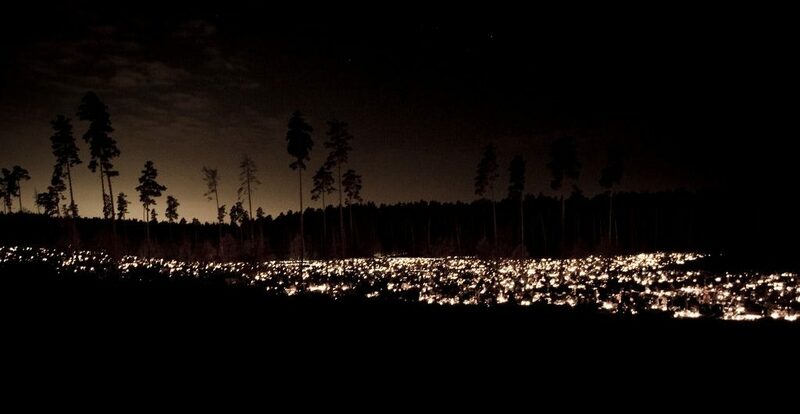 During Vėlinės, these old cemeteries are afloat with flowers and sinking in the sea of candles – people come to remember the dead heroes or prominent poets of the nation, but they also don’t forget the unknown graves of dead people whose relatives might not around anymore to light a candle. If you feel like venturing outside of Vilnius, Southern Lithuanian region of Dzukija and Lithuanian seaside will offer a very special glimpse into the culture of Lithuanian cemeteries, with their unique crosses and breathtaking nature that surrounds them. Lithuania’s Hill of Crosses, located in the northern Lithuania, is a unique and enchanting place, featuring over 100,000 of crosses of every shape and size, and attracting thousands of Catholic pilgrims as well as curious tourists looking for unique experiences. At the same time, you can find cemeteries in Lithuania that have no crosses – these are pre-Christian pilkapiai dating from 12-13th century, and abandoned in the 14th century, reminding everyone of pagan Lithuania. The most prominent site of pilkapiai is in Kernave, whose first residents arrived in the 9th century BC, and which later became an important city of pagan Lithuania. Visiting Lithuania would certainly be a unique experience, and a number of excursions can also integrate visits to other local attractions. To find out more about touristic or heritage tours in Lithuania, please visit Vilnius in Love.